The young woman before you looks self-assured, serene, and absolutely calm. Exact in grace with each and every one of her movements, Xianliang stands approximately 5'3" tall, and makes no effort to disdain her small stature. In fact, with the graceful way she moved, it feels as if she knows exactly how tall she is, and how to work the environment to her favor in that regard. She looks to be in young adulthood - perhaps adolescent because of her youthful glow, but perhaps also a young adult. Her hair is often dyed, streaking light brown or blonde in certain parts, though only highlighting her natural hair color: deepest black. 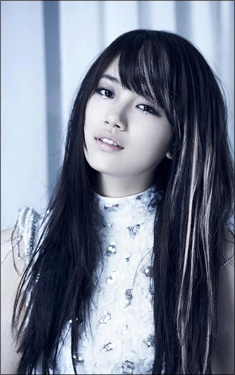 The hair itself is quite long, cascading down until the middle of her back and framing her small face with thick bangs. Her eyes are of a light brown color - more of a milk chocolate color than anything. Her lips are always curled upward in a semi-smirk, giving her the look that she is, quite often, very amused. You can definitely see the lines of her body, graceful and lithe. It seems that most of her height is in her legs, because she does seem quite a bit leggy. She isn't what you'd call skeletally thin, but she isn't voluptuous either. In fact, erring on the thin side, she looks to have a frail body even though that could be farther from the truth. With a light smile on her face, she would be reminiscent of a flower - easily plucked and in dire need of protection. Xianliang often wears very somber-looking colors, preferring a darker palette of blacks, dark greys, and deeper, bluish hues. She often wears intricate little mini-dresses, concealing most of her upper body but never encumbering herself in the legs area when there is a need to run. Her dresses are often quite gothic-looking, even though it could be farther from the truth. Sleeves are usually made of some sort of intricate lace, with a design of flowers that hint at the pale, alabaster skin underneath. Shoes are most often practical, sometimes stylish - loafers and moccasins, flats and sandals are among her favorites. To finish off her usually somber but stylish outfits, she wears small bits of jewelry - a ring or two, one on each hand and a necklace to finish off the ensemble. Quiet, introspective and perceptive, while also being emotional, anxious and sometimes just a bit too impatient, Xian is, what psychologists would say, someone who is more philosophical and intrapersonal, with a highly rich inner life dependent on herself rather than with others. Make no mistake: she isn’t antisocial nor awkward in social situations. She dislikes small talk, however, and is the type to listen and weigh things carefully, speaking only when spoken to or unless it is absolutely necessary to keep the conversation going. More like a father figure than a mother figure, Xian is completely contented with letting others make their own decisions, preferring to offer her opinions – which are most often, the right opinions – and leave them be. She is a pacifist and a counselor, preferring to logically talk things out rather than have to fight. However, this doesn’t mean she will avoid a fight completely. She will fight when it is absolutely necessary. As a Scion of Guan Yu, she knows when she has to beat the sense into someone before they will listen. Keen and polite with a distinctly political mindset (even though she has no interest in politics, unlike her father,) she is able to maneuver herself in a plethora of social situations, no matter how awkward or stressing it might be to her inside. Xian is the type who means what she says and practices what she preaches. She despises people who act high and mighty but never act the way they say people should when the situation calls for it: hypocrites, above all things. She dislikes people who lie to get their way – she prefers to err on the side of truthfulness, but she doesn't like to impose her opinions on other people. Underneath that veneer of serene and calm is an emotional storm. She just prefers to keep her emotions, anxiety and sadness bottled up inside, preferring not to let others into her inner barrier for fear of taxing them. She's just a bit too polite to be able to actively say what it is she's feeling. It doesn't feel natural to her to be so open about everything. There are chinks in her armor of serenity, though - no matter how politically correct she may act, when something annoys her or amuses her, the mask-like smile might become just a smidgeon higher, there might be a slight twitch in her eyebrow, her fingers might instinctively twitch, as a way to show the storm of emotions coming out from such a tightly sealed containment shell. Xian is a person who keeps people at varying distances. There are people who are easily able to penetrate through her armor, whom she believes are true friends. These people would never need to question her loyalty to them. No matter how manipulative or how much of a liar they might be in a given situation, if Xian knows their heart is in the right place, who is she to question how they run their life? Just because she lives in the straight and narrow doesn’t mean she imposes it on others. And because she lives on the straight and narrow, Xian is a firm believer that people get what they deserve. As someone who is always interested in finding the truth, she knows and believes that there are two sides to every coin - and at least two sides to every story. Even when she knows that one side is doing something for the betterment of others, she attempts to learn about every facet of the situation. Both natural curiosity and her tendency towards impartiality lends toward it. Unlike many Scions who might've suffered or was caused some undue pain before their Visitation, Xianliang had a pretty good life. Her mother was a woman who fled Mainland China to go to America after finding out she was pregnant - taking her rather large trust fund with her and escaping the clutches of her parents who would have disowned her. Xianliang's parents were strictly traditional and wealthy, and while they would have overlooked the occasional dalliance of her mother, what they could not accept was the birth of a child from that dalliance. It was absolutely unacceptable, and they would have paid to have the child aborted were it possible. However, Xianliang's mother knew that the young girl deserved a chance at life, so abandoning her old life and settling in New York for a new one was exactly what they both needed. It was a fresh start at life, and, Xianliang's mother thought, while her parents were incredibly unhappy with the decision, they would come to their senses sooner and later. Xianliang actually had a very good life, living with her mother. She never knew that she was the spawn of a night of passion between a God and Mortal, but she always suspected she was a little different from the rest. Xian always grew up with a good head on her shoulders: eyes that would always peer with such curiosity and perceptiveness that it was almost like she could see through any ruse. She also had a core of morality that was unshakable, perhaps a fruit from her father as well as the good teachings of her mother. This was what helped her be the charismatic individual she is today. Her friends (of which there were many,) would always pick up that Xian was a person who was a bulwark amid all the chaos, trying always to analyze the situation and find out what was happening objectively. But her good friends (of which there were few,) knew that it was because she always looked for the truth, and they would follow her stalwart example in the search of it. She knew she was different. Xian was always very self-assured, self-aware and she could read other people nicely. They would always fawn to her like she was a being of charisma, a leader they could all turn to. While it disconcerted her, it was really only a point of speculation for the young Scion. This was the age where she was beginning to accept the fact that her mother might never find love again, and the man who bore her was clearly the greatest love of her mother. The disconcertion she felt over the many… differences she had in her life over everyone else changed into understanding when at the age of 17, her father appeared to her in congratulations of her becoming a young lady. This was the day she finally learned of the Titanspawn, what she needed to do, and what was expected of her. Frankly, her father was so surprised that Xian had become so perceptive and non-judgmental, always seeking the truth over fighting courageously. She could only shrug, smiling at her divine parent. That was who she is. After his divine visit, everything changed. It was clear as day that Xian was still a bit too young, and it was only perhaps a year and a half ago that she found herself speaking to her Father. While she didn't ask if she could tell her mother, she decided to keep it a secret. Her mother clearly loved the man too much, and knowing that the man was Divine might shoot all of the hope inside her mother of ever meeting him again. The god could tell Xianliang's mother if he wished, but it was his secret to tell. Armed with the gifts and blessings of her father, she set out into New York City with one key goal in mind - to stop the Titans. Blaze - "Tea buddy. Quite flamboyant, and some sort of British royal. He seems quite fun - it would be intriguing to get to know him better." Haruki - "Tea buddy. Someone I have yet to figure out." Owain - "Tea buddy. He is prolific in deep quotes that make you think. It lends a certain air of wisdom about him." Green Dragon Crescents: Imparting with his daughter weapons that allow her both to strike at melee and at range, this pair of chakram rings are sharp and rounded. In fact, they're a bit larger than the usual chakram rings in that they resemble small hula hoops rather than discs, which make them a cross between a fenghuo lun, or wind-and-fire wheel, and a chakram. The chakrams themselves are rather ornate and intricate - a dragon intertwining around the "top" of it, acting as a handle when used in melee range. There are long, slightly jagged blades that come out all along the bottom, resembling the 'fins' of a dragon. They grant access to the War Purview, and they also return to the owner upon striking. It also shifts between a throwing weapon and a melee weapon. Jade Emperor's Sigil: The Sigil is an emblem embossed into a jade bangle that Xianliang often wears. The sigil itself appears when the relic is used, appearing as a magic symbol in the air of two green dragons intertwining around a ba gua. The Jade Emperor's Sigil grants access to the Guardian and Justice Purviews.